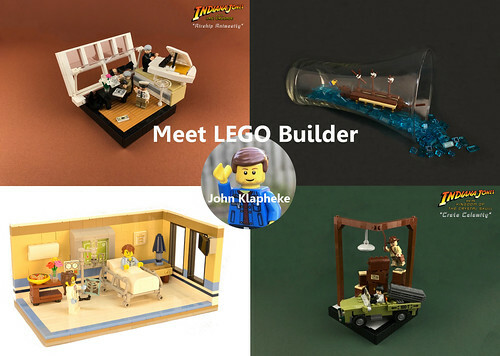 Meet LEGO fan John Klapheke, also known as BrickBuilder7622 on Flickr! John has been posting his MOCs to Flickr since 2014, building everything from Indiana Jones to a Lunar Landing Module. We had lots of questions for him - read on for his take on the thrill of the brick! Tell us a little bit about how you got into the LEGO hobby in the first place - when did you start building? What sparked your interest? Technically, I have been building for over a decade now... I was handed a LEGO Duplo train set for my birthday when I was three - I remember at age four or five when I first saw Star Wars I built some mini-TIE fighters using three 1x6 bricks. But I have avidly been building MOCs since I was about 14... it was during the summer that year that I saw on LEGO.com Creator that there were monthly building competitions - seeing all the custom creations that people built blew my mind, and I knew that I wanted to partake in the creativity. Obviously, building as much as you do, there's something about LEGO bricks that really appeals to you. What is that? Something indeed does appeal to me about LEGO, and that's its universality and limitless possibilities. That and it's just so cool. Everyone I know loves LEGO, and you are truly never too old to be inspired. Being lost in inspiration and wonder is a great effect to LEGO - there's always some new idea/design that can be thought of! What's your favorite subject matter when it comes to building? Do we even need to ask, or can we just say: Indiana Jones! Favorite subject matter... probably whatever particularly inspires me at the time of building. So yes, as of recent it is Indiana Jones, but in the next month or so, what my focus will be is on something totally different. I hesitate to say that I have one specific theme of building, since I try to build in every theme. The themes I build in are always evolving, and that's a lot of fun, because I don't always know what I am going to build next. It keeps it interesting. Do you have a favorite LEGO color? I am quite partial to the sand colors of LEGO, whether that be green, blue, red, or even yellow. Burnt orange is another personal favorite but also chrome too... To name a favorite would be an impossibility at this point! About how long do you usually spend on a build? I spend way too long at times on a build... for a series like the Indiana Jones vignettes (something I projected would take a month) ended up taking about two months due to college preparation, work, and many other commitments. I would say for other MOCs (32 x 32 size) 2 weeks is a good guess-timation. What do you find to be the greatest challenge when it comes to building? The greatest challenge I find when building is trying to insert as much detail as possible into a creation without over-saturating it. That and making it look good from different angles. Its often said that when builders photograph a MOC that is strictly being posted online that you can kind of "cheat" and build only half of the build for the picture - but when you're building something for a show or video, you have to make sure that there is consistency and secure structure throughout. Could you walk us through your usual building process? My building process is anything but organized... but as cliche (and obvious) as it sounds, it always starts with an idea. This being said, I kind of have this version of LEGO Digital Designer in my mind, so that after some careful considerations and thinking, I usually know what the model is going to look like in my mind before I even start building. Then there are other times that I have no idea what the build is going to look like (such as for "Ventures in Venice") and I just let the bricks form their own MOC. John kindly sent us some pictures of his LEGO building area, so we can get a behind the scenes look at the room where he creates his MOCs! Tell us a little about your favorite of all your own creations! Why did you build it? How long did it take you? What was special about it? My favorite out of all my creations... Well, I haven't built it yet... ! 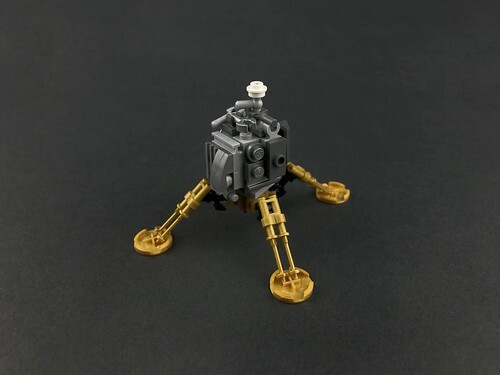 If I had to choose a current existing build of mine to call my favorite, I would have to choose the Lunar Landing Module built as a last minute final entry to the ABS Builder Challenge. What's special about this build (for me at least) is that it encompasses many little "goals" that I try to accomplish with MOCs: minimalistic, detailed, interesting part usage, okay-ish photography, and a subject matter that people can relate to/recognize. Total time for building that maybe took me a few hours, not bad considering my normal build time! You're famous for your Indiana Jones series of vignettes and it's easy to see that you built your heart into them! What is it about LEGO and Indiana Jones that you enjoy so much? What gave you the motivation for your series? Out of the 24 amazing vignettes, do you have a favorite? I'm famous for my Indy vignettes?! Pffft, I would hesitate to say famous, haha. But I did try to put my heart into them - LEGO Indiana Jones made up a lot of my childhood, but no matter how hard I tried when I was a kid to recreate the scenes from the movies, I was always dissatisfied for their lack of detail or organization. What gave the motivation for the series was having seen online and in person the Harry Potter vignettes done by this wonderful group of builders: www.flickr.com/groups/harrysmagicaljourney. My top three favorite Indiana Jones vignettes are "Railroad Rollercoaster", "Gator Bridge Getaway", and "Cascading Car". It's hard to pick a favorite of your builds but one that really grabbed my attention was your micro train. The use of flowers still attached to the sprue is brilliant! How did you come up with that? What inspired the micro train? The Micro-Train? Interesting (and speaking of which I have been meaning to make another MOC with that in it, thanks for the reminder!)... Whoa, its been so long since I posted that... I think I may have been inspired by a past BrickWorld convention, but I'm not sure. I've definitely always loved trains, so I suppose that that was a reason. Can you tell us about a build that you were proud of, but that was relatively unpopular in terms of favorites and comments? Do you have any explanation for that phenomenon? I'm sure you've got lots of favorite creations from other builders, but pick one and tell us why you like it so much! 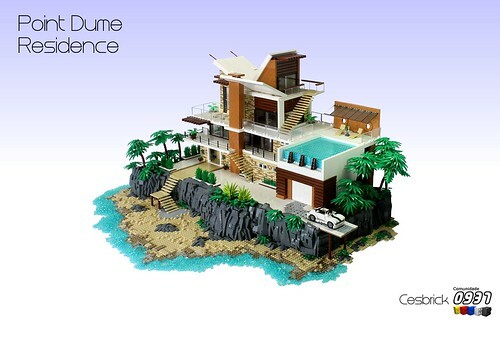 One of my favorite creations of all time is Cesar Soares' "Point Dume Residence". 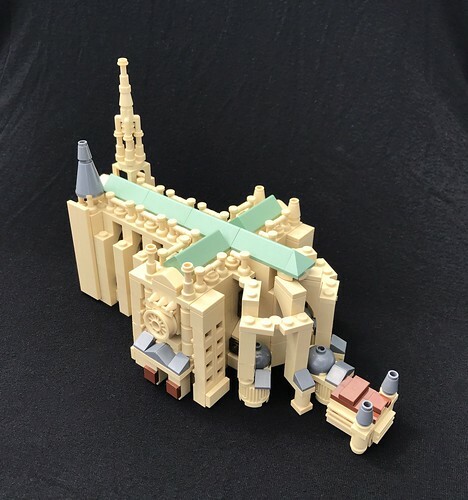 This build encapsulates everything I love about LEGO building: detail, ingenious parts usage, elegant design, beautiful architecture, diverse array of parts, perfect photography, and just overall a brilliant idea for a model. When you finished your series of Indiana Jones vignettes you said that your next project was going to be "one of the most ambitious projects in LEGO history" - any chance you'd want to give us a hint as to what that might be? I was inspired to build this model from learning about it in my senior year of high school and hearing that some of my builder friends were undertaking large LEGO projects. Soon I may be able to visit it in person, so that would be really neat! One of the awesome things about the LEGO hobby is that it connects you with so many other builders. Have you been able to participate in collaborative efforts with other builders? If you have, tell us about the experience! I have been able to participate in various collaborations. Few years ago, I did a collaboration with one of my coworkers and some of our friends - it was kind of like a modern combat scene, some of it based off videogames, and others based off a storyline that he was writing. Last year I partook in the large-scale Scarif collaboration from the latest Star Wars movie, which was really awesome. Props to people from both collaborations from doing a really splendid job! And I think that I am soon doing a collaboration with this group called InnovaLUG... more on that later! Are you able to meet with other LEGO fans in real life, or just online? How do your interactions with other LEGO builders help expand your horizons? 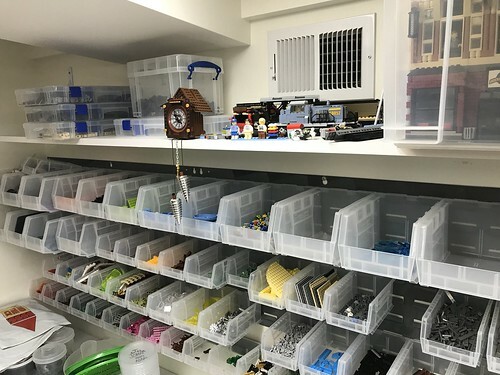 I have been fortunate enough to meet all sorts of LEGO fans throughout my experience - everyone from brand-new fans to the hobby, to avid builders, to LEGO designers themselves! Interactions with other builders influence me a ton - I often keep up with many of them through texting, Discord, Hangouts, Flickr Mail, etc. Its a pleasure to keep up with the community as it keeps me inspired and offers me a chance to ask for advice with builds. Horizons are further expanded through being able to introduce fans to other fans - the community literally "builds" itself up and through keeping a focus on creativity, great things always result. I know you've attended LEGO conventions - are you able to do so frequently? What do you enjoy most about them? I usually attend LEGO conventions during the summer (most commonly BrickWorld Chicago and BrickFair Virginia), although I also attend my local BrickUniverse show during January. LEGO conventions offer the best opportunity to be able to connect to your fellow builders. You've basically 18 hour days of constant non-stop LEGO fun - its truly an awesome experience that you'll never forget. I always leave conventions so inspired and pumped about building. A big thing in the online LEGO community is frequent contests and competitions for sharpening your skills - are contests a big thing for you, or do you just participate when you get time? I agree, I'm starting to see a lot more competitions sprouting up here and there online. Contests aren't that big of a thing for me, so I try to limit the number of ones in which I partake. With the most recent challenge I was in (the ABS Builder Challenge), I found the most challenging aspect to be time - a lot of stuff was happening in life, and I found that my responsibilities were sadly outweighing my build time. I am really happy that I got to participate in that... it's given me some impetus to sign up for more competitions in the future. I've noticed that you have some really pretty photographic shots of real life buildings and nature scenes on your photostream - is photography another hobby of yours? Do you have any other hobbies you'd like to tell us about? 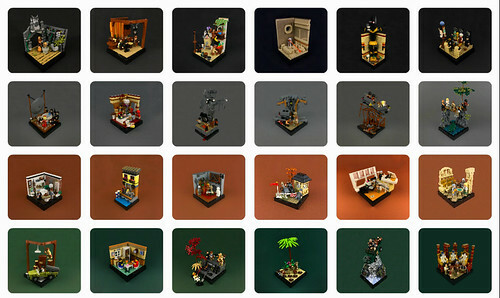 Are you able to tie some of these in with your LEGO hobby? 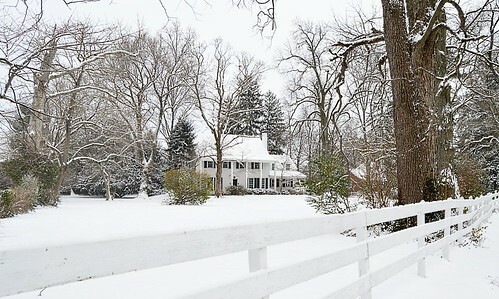 Photography is another one of the many hobbies of mine! I have recently joined a photography organization at my university, and just recently became a part of their executive board - I couldn't be more excited. It gives me a chance to be able to expand my creative endeavors beyond LEGO building and that's really the beauty of creativity - it's so universal, it's not restricted to just one medium. I do have several other hobbies (cycling, swimming, playing the accordion, film-making) that all in their own way incorporate some form of being outside or involving creativity. What field are you working/studying in? Do you see your LEGO hobby possibly playing a role in your future job(s)? Job-wise I work at a store that sells new and used LEGO products and in college I am currently pursuing a degree in Design, Arts, Technology and Communications. I have been discerning a career for quite a while - I have considered everything from being an archaeologist to becoming an architect. But the idea of being an employee for the LEGO Group (particularly that of a designer) has really stuck with me for quite a while now. It is the goal that I am currently working toward at the moment... we shall see what transpires! What do your family/friends think about your LEGO hobby? Are you a nut, or a cool guy? Have you been influential in bringing someone else into the LEGO hobby? I am known as "LEGO John" on my college campus, so if that answers anything about what my friends think of me, there you go. My family thinks it's an interesting pastime, and every time we have a family gathering, it is a familiar topic that is brought up. People do enjoy seeing my creations because they know I am passionate about LEGO - I'm not simply saying, "oh look what I made" - there's a story behind it. To people, I am known as a cool guy who is a nut over LEGO. And I wouldn't have it any other way. I don't know if I have been influential in bringing someone else into the LEGO hobby, but I hope that I have been inspirational to at least a few people - that again goes back to the whole "LEGO community building off itself" concept. Tell us about some neat real life opportunities being a LEGO builder has thrown in your way. There have been many, many real-life opportunities that have resulted from being a part of the LEGO community, most recently a speech I gave in my public speaking class about the art of LEGO building. But there have been other opportunities such as getting to work at my current job, doing some sideline commentary for Beyond the Brick, being part in a blog (thebrickbucket.blogspot.com), getting a chance to do a commission (and another one, coming up soon! ), having a chance to talk to LEGO employees, being part of different LUGs, getting a chance to develop my own website, and meeting some of the best friends that I have. Without LEGO, I don't know where I would be - it has played such an essential role in who I have come to be. Got any parting words for the builders out there reading this? Closing words? First off if they have made it this far, I sincerely congratulate them! 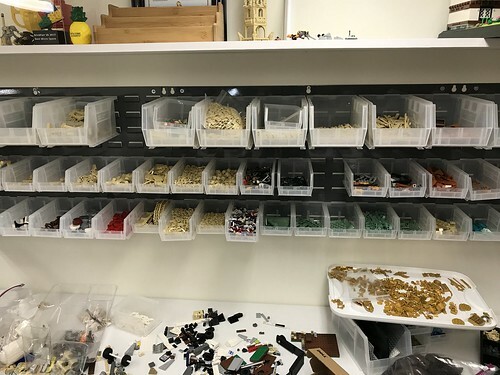 One thing that I often tell people about LEGO is how liberating it is - you are the designer, you're the creator, and the bricks are the tools that you can use to show your ideas. Ideas are worth sharing, and creativity is always worth spreading. LEGO building is a fun hobby, it's a timeless pastime, and it's undoubtedly for all ages. LEGO never ceases to amaze me because I see so much personality that people put into their builds, and when I see the personality, I see the person and their ideas reflected there and that is something beautiful. So with that, I say stay creative, never stop building, and in the words of the famous Ole Kirk Christiansen, "leg godt." Thank you for taking the time to answer our questions - and keep bricking! We're looking forward to that cathedral! Note: Semi-colons in John's answers have been changed to dashes and winking faces (for semi-colon reasons) have been changed to exclamation points.